In this edition of the SA parkrun newsletter, we see the launch of two new parkruns in two weeks, at Kraalkop and Golden Harvest. We also take a look at how parkrunners are helping an athletics club in KZN and hear from a proud father who tells us how parkrun helped his son beat bullying. It seems we are in for an early spring, as there has been glorious weather at the launch of our last two parkruns. We launched Golden Harvest parkrun two weeks ago on a beautifully sunny morning in North Riding, near the Dome in Johannesburg. Kim MacCallum and her team have laid out a tough but beautiful parkrun in a park so many of us have never heard of, let alone run in. Over 400 eager parkrunners tackled the hilly route, which winds around a dam, over a bridge and up some steep hills. 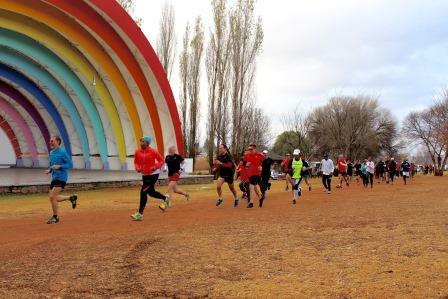 Afterwards, the consensus among experienced parkrunners was that Golden Harvest could be the toughest South African parkrun. However all agreed that is a challenging but fun parkrun and will be very beautiful once the first summer rains have fallen. On the 15th we started Kraalkop parkrun, our first Gauteng parkrun, under the guidance of Manie Esterhuizen and event director Elmarie Hayes. Manie is our regional director for North West Province parkruns but Kraalkop parkrun is so close to the provincial border that we consider it as being under his jurisdiction. It was windy but warm on launch day and the 150 parkrunners (both newcomers and experienced parkrun tourists) were delighted to run past herds of blue and black wildebeest, eland, zebra, springbok and giraffe. It was also quite inspiring to realise that the mining headgear visible near the start was proof that 4500 metres below us miners were busy mining gold in the world’s deepest mine. 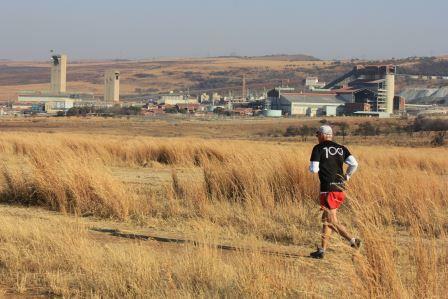 Kraalkop parkrun will draw many parkrunners from the mine itself and from the neighbouring towns of Fochville, Parys and Carletonville. This Saturday we look forward to starting our first parkrun on the West Coast at Langebaan, organised by Chantal van der Nest and her team of volunteers. They couldn’t have timed their launch better. It’s flower season on the West Coast and hundreds of tourists are flocking to the area to view the flowers at their peak. After that there will be time for us to all draw breath as there is a break in September for the country managers’ conference in Cork, Ireland before some exciting new parkrun launches in October and November. 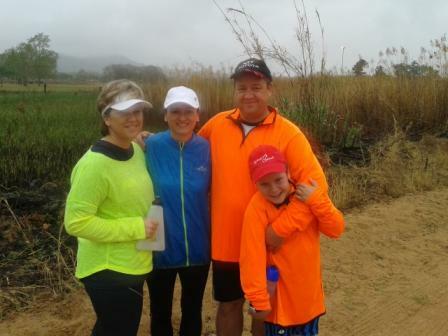 Robin Archer has written to us from Shongweni parkrun in KZN to tell us about an exciting initiative at this parkrun. 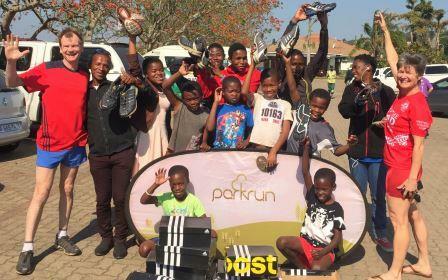 Robin is the event director at Shongweni and his parkrunners were able to donate running shoes to the Inanda Qadi athletic club and their coach Lonwabo Magwa. Kylie Griffin, chairperson of the KZN Cross-Country Commission, was also present at the handover. The club members of Inanda Qadi operate under challenging circumstances, so the donated shoes will be a wonderful encouragement for the club. Robert Boulle, the lucky winner of the Team Vitality parkrun competition, is off to Australia with his wife this month for a fun-filled adventure ‘Down Under!’ He’ll be jetting off on Qantas with brand new adidas kit worth R5000. Well done again to him for being an avid Team Vitality member and a supportive parkrunner. For more information, visit the Discovery website. When I heard that my son, Nathan, was being teased and bullied at school it bothered me as it would any parent. On one occasion Nathan was told “why don’t you roll down to the tennis courts; you’ll get there faster.” That hurt me, so I could only imagine what was going through his mind. Having his own challenges like everyone does, Nathan tackles everything with enthusiasm. Occupational therapy for his low muscle tone was a challenge that he embraced. Not being a sporty kid, we parents needed to find something to do to help. Nathan went along with his mom to Run Walk for Life, and enjoyed the structure and that fact that he was competing against himself. While Nathan was still in Foundation Phase the head teacher, Mrs Wakefield (a regular parkrunner herself) tried to inspire the children to do their 10,000 steps a day. This message struck a chord with Nathan and he would often suggest walking the dogs with me after work to make up his 10,000 steps. We heard about parkrun via Discovery Vitality, registered, and the rest is history as they say. parkrun has been a revelation to Nathan. Often I get woken at 06:30 on a Saturday morning by a young boy already dressed for parkrun. This doesn’t happen on school days, by the way. We have also done many Fun Runs and two 10kms along the way, inspiring friends & family to join us. We had a big scare when Nathan was diagnosed with Osgood-Schlatter Disease, but luckily our family GP has allowed him to continue running, but not doing more than 5km’s and avoiding tar roads as far as possible. Halls parkrun is allowed, as it is a mix of dirt and tar roads, so we are there every Saturday we can be! Most of the bullying has now stopped and Nathan has much more self-confidence. He has also gained the respect of his peers as a result of his determination in completing 50 parkruns before his 10th Birthday. Now he can’t wait to get to 100! Thank you one and all for your role in parkrun. Much appreciated!!! On Saturday 15th August, I started running again after a few months break. I was really excited to do the Bryanston parkrun. Around 2 km into the run, I tripped and fell on my left arm. This caused the shoulder to pop out of the joint as well as cuts on my arm and left thigh. I want to give a heartfelt THANK YOU to the two Good Samaritan women who assisted me through this agonisingly painful moment. I was hurt physically, emotionally and mentally. They helped me in all these spheres. Most memorable or funniest parkrun moment: The realisation on the day that we had more than 1000 parkrunners at a single event this January! What do you like about volunteering at parkrun:: The smiles, the ‘family feeling’ and team spirit. Why should others volunteer at parkrun? : It’s fun, and it feels good to do something for other people, the community and fellow parkrunners. What his fellow volunteers say about him:: Kobus is an instrumental part of our core team and looks after the logistics of parkrun. He can fix anything! Kobus is always first to offer help, from printing to signs to building a platform for the Run Director to stand on for the pre-run notices. Root 44 parkrun would like to thank him for all the work, time and effort that he puts in to make our parkrun such a success. In this edition of the SA parkrun newsletter we welcome a new supporter, take a look at the launch of the first parkrun in Soweto and hear from a parkrunner who drew on her experiences at parkrun to endure the gruelling Marathon des Sables earlier this year. We are delighted to welcome Dis-Chem to the parkrun group of sponsors and supporters. Dis-Chem will join as a very welcome parkrun supporter. Apart from being a very useful supporter in the future, offering special savings and promotions to our registered parkrunners, they will also be supplying a first aid kit to every parkrun. We look forward to an exciting future with Dis-Chem. We don’t have to remind our parkrunners that the reason we are able to bring parkrun free to parkrunners is because of the wonderful support of companies like Dis-Chem and our sponsors, Blue Label Telecoms, Discovery Vitality and adidas. 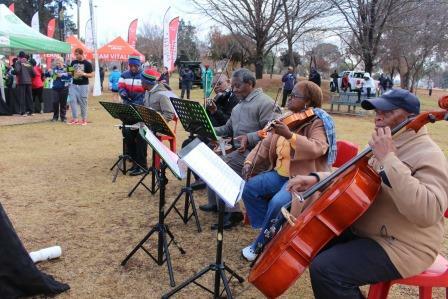 Two weeks ago we celebrated the launch of Mofolo Park parkrun in Soweto. It was no secret that we were very keen to establish a parkrun in iconic Soweto and after many months we finally got started in Mofolo Park. Thanks to the hard work and support of Boitumelo Mofokeng and her team, and Louise Gordon and the people at JHB City Parks the launch was a great success with a unique Soweto flavour. Depressingly freezing weather and rain were predicted for the Saturday morning launch. Fortunately however in the end the rain stayed away and although it was cold, the warm Soweto welcome made it a special morning for all; local parkrunners and visitors alike. We even conducted the launch from a flower bedecked podium while an orchestra played and youngsters danced. There cannot have been too many more entertaining route descriptions than that given by Boitumelo “Listen to the instructions given to you by the very handsome marshal at the top corner. And please say hello to him. That’s my son!” She commanded before going on to describe every inch of the route in a booming voice. This Saturday we will launch the Golden Harvest parkrun under Kim MacCallum and her team. One of the wonderful gifts of parkrun is how it has enabled us to discover our parks. Many Johannesburg parkrunners residents had no idea that there was a large park lined by streams and ponds close to the Dome and Northgate. We have now discovered another important and attractive park in our city, but be warned parkrunners – it’s a tough, hilly 5kms! parkrunner Alison Turrill lived in the UK for several years but never discovered parkrun. In fact Poole parkrun was her closest parkrun in those days and though she was aware of a group run on Saturday mornings she did not run a parkrun. 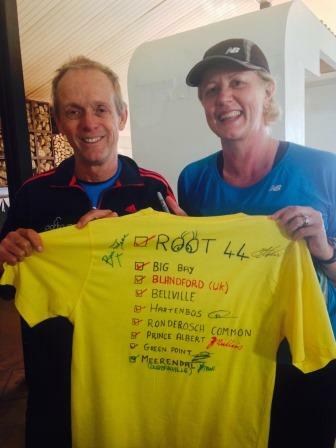 She discovered the magic of parkrun when she returned to South Africa and ran Root 44. Since then she has run a number of SA parkruns and has made herself a unique T shirt to record her various completed parkruns. This month she has returned to the UK for a visit where she will finally run Poole parkrun! It’s a grand slam victory! Tennis legend Boris Becker will be joining us at this year’s Vitality Summit. Vitality members get a 25% discount by simply using their ID number when they book their ticket. Tickets are limited so book yours today! Go to www.vitalitysummit.com for updates on speakers and other important details. 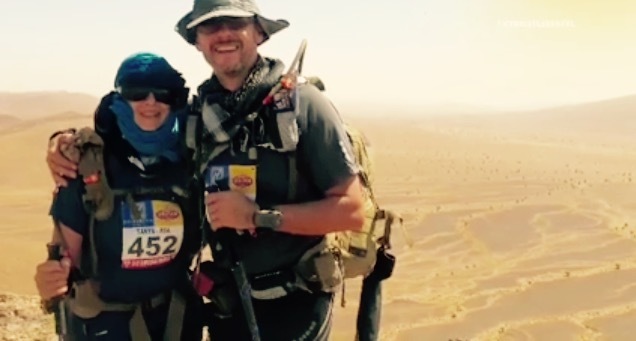 My husband and I recently returned from competing in and completing the Marathon des Sables in Morocco. National Geographic named it "the toughest footrace on the planet." I don't possess a natural ability to excel in my sport and in life; I just have the courage to continue where others give up and to persevere when faced by life's hurdles. I had the inner strength to finish the race. I learnt what I could accomplish despite my many fears. By standing up and facing that which cripples me and keeps me from trying I was able to overcome everything the desert threw at me, including temporary blindness, severe dehydration and losing most of my toenails. The MdS is a 7 day multistage, self-supported footrace of 250kms through the Sahara desert, and was described as "more hellish than hell," by Sir Ranulph Fiennes who also participated. You complete the equivalent of a marathon a day, including the longest stage of 91.4 km. It was so foreign to me it felt as though I had passed through a portal into another world, almost as if I was transcending through the realms of Hell in eternal servitude to the Devil, who in this case was the race director and organizer Patrick Bauer. How do you get through Hell? You keep on walking! I carried my 9kg backpack through the duration of the race, traversing treacherous mountains, along high mountain ranges, through desert sand storms and over endless salt pans and rolling dunes. I was totally outside of my comfort zone. I did it for the females in my family, especially for my daughter. She inspired me through her faith and belief in me. I wanted her to be proud of me and to know that she can do anything her heart desires and not to be afraid to go after her dreams. My husband and I ran it together and he stayed by my side through the duration of the race, his ongoing encouragement and motivation giving me the strength I needed to keep it together and complete each day. When I was in need of extra motivation I thought of parkrun and my friends at Botanical Garden parkrun. I had so many visions of us running Botanical Garden. When you see the bleakness of the desert you appreciate the grass, plants and birds that we are privileged to see every day. parkruns definitely helped us with stamina and speed. You can find out more about the Marathon des Sables here and here and you can read more of Tanya’s experiences on her blog. Having completed 68 parkruns now, I have taken a liking to trying out new venues around Gauteng and the country, with the possible goal one day of doing every venue in the country (that’s if parkrun SA ever slows down the rate at which they open!). It adds a unique challenge and element of fun for me, but apart from that, it gets you to parts of the country you wouldn’t otherwise visit. This past weekend I decided to visit the brand new parkrun at Mofolo Park in Soweto with my father (who has also completed over 30 parkruns) despite the close-to-zero temperatures. Within minutes we were greeted by the warm smile and welcoming personality of Boitumelo, event director of Mofolo parkrun. I am always in awe of the kind volunteers who make their way every Saturday to ensure us parkrunners all get to complete our 5km and have a good time. This being said, Boitumelo was one of the most passionate event directors I’ve seen. Starting with a solid 160 runners the week before, they were quite content to serve the 30 runners who arrived on Saturday with the same level of enthusiasm and excitement. Mofolo parkrun have not even scratched the surface in terms of potential, but then again its only week 2. I am confident that with ‘Boity’ and team in charge, this will become one of the busiest parkrun venues in the country. Thanks for the warm welcome and enjoyable morning. What this made me realise was just how much parkrun affects a community aside from the obvious health benefits. It connects people of every age, gender, race and religion – through a simple yet powerful initiative of running together. There is one belief parkrunners all share; that being active is a solid step (literally) towards a healthier lifestyle. 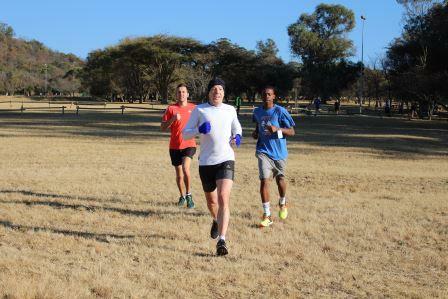 I look forward to the continued growth of not only Mofolo parkrun, but all venues alike. Keep up the GREAT work.